in a Digitally Connected World report. Bots are automated programs that run independently to perform a series of specific tasks, for example, collecting data. Sophisticated bots can handle complicated interactive situations. More advanced programs feature self-learning capabilities that can address automated threats against traditional security models. Automated software applications can streamline processes and positively impact overall business performance. They replace tedious human tasks and speed up processes that depend on large volumes of information, thus contributing to overall business efficiency and agility. Scraping and Data Theft — Bots try to access restricted areas in web applications to get a hold of sensitive data such as access credentials, payment information and intellectual property. One method of collecting such information is called web scraping. A common example for a web-scraping attack is against e-commerce sites where bots quickly hold or even fully clear the inventory. Performance — Bots can impact the availability of a website, bringing it to a complete or partial denial-of-service state. The consumption of resources such as bandwidth or server CPU immediately leads to a deterioration in the customer experience, lower conversions and a bad image. Attacks can be large and volumetric (DDoS) or not (low and slow, buffer overflow). Poisoning Analytics — When a significant portion of a website’s visitors are fictitious, expect biased figures such as fraudulent links. Compounding this issue is the fact that third-party tools designed to monitor website traffic often have difficulty filtering bot traffic. Fraud and Account Takeover — With access to leaked databases such as Yahoo and LinkedIn, hackers use bots to run through usernames and passwords to gain access to accounts. Then they can access restricted files, inject scripts or make unauthorized transactions. Spammers and Malware Downloaders — Malicious bots constantly target mobile and web applications. Using sophisticated techniques like spoofing their IPs, mimicking user behavior (keystrokes, mouse movements), abusing open-source tools (PhantomJS) and headless browsers, bots bypass CAPTCHA, challenges and other security heuristics. Gawky bot attacks against websites are easy to block by IP and reputation-based signatures and rules. However, because of the increase in sophistication and frequency of attacks, it is important to be able to uniquely identify the attacking machine. This process is referred to as device fingerprinting. The process should be IP agnostic and yet unique enough to be confident to act upon. At times, resourceful attacking sources may actively try to manipulate the fingerprint extracted from the web tool, so it should also be client-side manipulation proof. Web client fingerprint technology introduces significant value in the context of automated attacks, such as web scraping; Brute Force and advanced availability threats, such as HTTP Dynamic Flood; and low and slow attacks, where the correlation across multiple sessions is essential for proper detection and mitigation. For each fingerprint-based, uniquely identified source, a historical track record is stored with all security violations, activity records and application session flows. Each abnormal behavior is registered and scored. Violation examples include SQL injection, suspicious session flow and high page access rate. Once a threshold is reached, the source with the marked fingerprint will not be allowed to access the secured application. Ultimately, understanding and managing bots isn’t about crafting a strategy driven by a perceived negative attitude toward bots because, as we’ve explained, bots serve many useful purposes for propelling the business forward. Rather, it’s about equipping your organization to act as a digital detective to mitigate malicious traffic without adversely impacting legitimate traffic. Organizations need to embrace technological advancements that yield better business performance while integrating the necessary security measures to guard their customer data and experience. 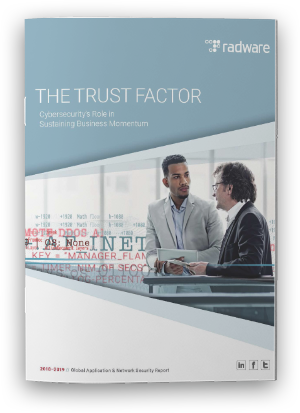 Read “The Trust Factor: Cybersecurity’s Role in Sustaining Business Momentum” to learn more. Next PostWill We Ever See the End of Account Theft?